Paddington!! Your favorite Marmalade-loving Bear celebrated his summer birthday today (June 25th) at the Cubs vs. Dodgers baseball game at Wrigley Field, alongside his fellow friend Clark the Cub. In honor of the recent Blu-ray, DVD & Digital release Paddington was bestowed the gift of throwing the first pitch of the game! 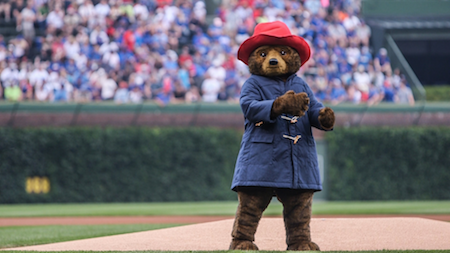 As fans in the stands wished a happy birthday to Paddington, the Chicago Cub’s Mascot, Clark, escorted him to the pitcher’s mound and coached Britain’s Marmalade-loving bear on how to throw an American baseball. Paddington tossed out the game’s ceremonial first pitch, followed by taking photos with Clark and kids at Wrigley Field. PADDINGTON tells the story of the comic misadventures of a young Peruvian bear who travels to London in search of a home. First introduced to children in Michael Bond’s 1958 book, A Bear Called Paddington, and the subsequent Paddington Bear series – which has sold over 35 million copies and been translated into 40 languages – Paddington is now an utterly charming and fun hit film, available on Blu-ray™, DVD and in Digital HD for all to enjoy at home. From writer-director Paul King and producer David Heyman (Harry Potter Films), the film features a stellar cast with Emmy® nominee Hugh Bonneville (TV’s “Downton Abbey”), Oscar® nominee Sally Hawkins (Blue Jasmine), Oscar nominee Julie Walters (Billy Elliot, Educating Rita), Oscar winner Jim Broadbent (Iris), Peter Capaldi (TV’s “Doctor Who,” “The Musketeers”) with Oscar winner Nicole Kidman (The Hours), and Ben Whishaw (Skyfall) as the voice of Paddington. The Rotten Tomatoes Certified Fresh film has earned over $259 million worldwide at the box office to date.